Why writers shouldn’t give up. Writing can be one of the most isolating and thankless jobs around. Unless you have a contract for that article, essay or book, you’re working on blind faith that somebody, somewhere might want it. And then the rejection letter (or e-mail) arrives. Whether it’s your first or only the most recent in a long line of “thanks, but no thanks” missives, you wonder whether there’s a point. Will anyone ever want to read your words? As someone who’s made a living writing for 31 years, I have one piece of advice: Don’t give up. Easy for me to say, right? But I didn’t succeed right from the get-go. Recently I was a guest on Dot Cannon’s “Over Coffee” podcast. The interview, titled “Game-changing the future,” included topics like how I got into print journalism without a college degree and how I became a freelance personal finance journalist. More than once I’ve wanted to give up on my life because I felt I couldn’t manage another day or because I couldn’t see a place or a point where I would be happy. After I’d left an abusive marriage I despaired over how I’d make a living. Eighteen years of newspapering left me feeling unfit to do anything else. But thanks to the decline of print media, newspapers were firing, not hiring. A piece of sheer luck – an old friend was now working for MSN Money – landed me a freelance opp, “Surviving (and thriving) on $12,000 a year.” The response was so great that I was hired to write some additional articles. I didn’t count on it lasting; these were just some extra paychecks to throw against my divorce-related debt. Imagine my surprise when an MSN Money editor asked me to start its Smart Spending blog. During the podcast interview I recalled that I wasn’t even sure what a blog was back then. However, I figured I’d learn it right quick when offered a salary to do so. Suppose I’d previously given up on the idea of writing and taken the first cubicle job I could get. Then I wouldn’t have gotten my university degree, and I wouldn’t have had the chance to make a difference in people’s lives. That last is not self-serving hyperbole, by the way. Some MSN Money readers sent me e-mails like “I’m out of debt because of you” or thanking me for a frugal hack that was helping them balance the books in the dizzying, daunting days of the recession. The next few years were often scary and always exhausting as I mixed university classes, apartment-building management chores, three articles a week for MSN Money, helping my disabled adult daughter and adding odd jobs when I could get them (very worried about my divorce-related debt). And so should you. Writers generally toil in obscurity until they find their audiences and/or the editors who will give them a shot at magazines or books. When your blog readership is low or you’ve just gotten a rejection slip, it’s easy to want to quit. Don’t. Take a breather if you must. But if you’re really a writer it just won’t feel natural to quit forever. Instead, stop what you’ve been doing and start something new: a blog, a newsletter, reviewing your favorite books for a site like GoodReads. Make notes for a blue-sky project. Post this advice in front of your workspace: What would you attempt if you knew you could not fail? You have no idea what might be just around the corner. 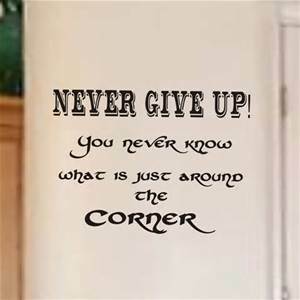 But if you stop moving forward, that corner will never be reached. As for those rejection slips? I once interviewed a writer who papered his downstairs bathroom with them. Ultimately he became a successful children’s book author. Wonder how many of the rejecting editors wound up kicking their own butts for not taking a chance on him? Writing is scary. Don’t be scared!